The Duplicity of Prince Andrew and It’s not Sherlock-Sherlock! Sir Arthur Conan Doyle is perhaps best known for his creation of the fictional figure of Sherlock Holmes. Keen Sherlock Holmes aficionados suggest a link between Holmes and nineteen-century Edinburgh medical school lecturer, Joseph Bell, grandson of forensic surgeon and pathologist, Benjamin. 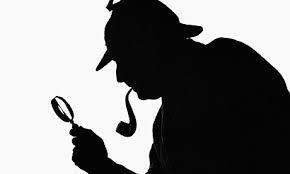 Keen observation and deductive reasoning were the hallmarks of Bell and Holmes’s observations. Joseph Bell, for example, would demonstrate this ability to his students by picking out a stranger and be able to tell them his or hers occupation and recent activates. Students, including a young Conan Doyle, were invariable as dumbfounded as the bumptious narrator of the Sherlock Holmes’s tales, Dr Watson. A Scandal in Bohemia, for example, finds Holmes telling Watson, ‘Wedlock suits you.’ He doesn’t then say you’ve grown fat, but ‘you have put on seven and a half pounds since I last saw you.’ Note the precision. Holmes goes on to bewilder Watson by his observations that the latter has been ‘getting yourself very wet lately and that you have a most clumsy and careless serving girl’. But a close reading of the text suggest Holmes and, by deductive reasoning, Bell might have had a bit more help than a pitiful serving girl. For example, Holmes is sent a note without signature or address. He studies it very carefully and is able to deduce from it that the sender does not want to be identified, and for good reason. The Crown Prince of Bohemia has been, like our Prince Andrew (allegedly), been up to a bit of hanky-panky. From the bit of paper Holmes is able to tell Watson that the Crown Prince is six feet six inches, plenty of meat on the bones ‘with Herculean chest and limbs’ and he had a strong character. Serving girls don’t have characters, they are just careless, and always say they are eighteen. I’m surprised, however, that no one has picked up on the real power behind Holmes’s success, which was not simple observation but his ability to nip off into another room and google on the internet what the Bohemian Crown Prince has been up to recently. Crown Princes need to watch out for these kind of dastardly tricks, especially from (allegedly) servicing girls.